Native Americans living on the rural and remote reservations of the Northern Plains struggle daily with isolation, limited employment opportunities, and a harsh and resource-poor environment. Poverty is all too common and weighs most heavily on those who are most fragile — the elderly, children, and families. at the end of the month." 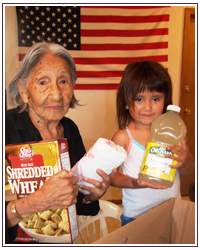 The American Indian Relief Council (AIRC) program helps these proud people improve the quality of their own lives by providing opportunities for them to bring about positive changes in their own communities. Our focus on volunteerism helps build stronger communities. Our goal is to create self-sufficient communities, so substantial community volunteerism is a part of the processing or distribution of these goods. Local volunteers help with projects such as delivering food to homebound Elders or sorting bulk deliveries of diapers into family-size packages for Baby Baskets. Incentive items such as baby food, clothing, and personal care items are often distributed to volunteers to thank them for putting forth the extra effort in their communities. This unique approach of earning and learning through volunteerism makes AIRC services more like partnering and less like charity.